The Coastal Comedy Show headlined by Raymond and Mr Timpkins! 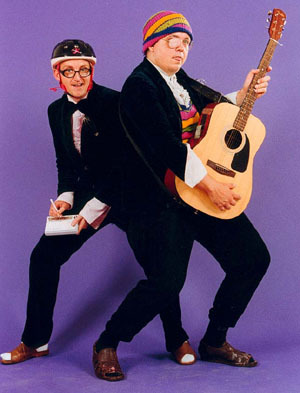 Home > Whats On > The Coastal Comedy Show headlined by Raymond and Mr Timpkins! Legends of the comedy circuit. It’s freakish entertainment on a twisted stick’, the charismatically challenged uncle and nephew duo, invite you into a world of stylophone rock anthems, brushed velvet arousal and ‘indulgent, brilliant tackiness. Opening the show is the fabulously funny Matt Price. Among his fellow comics Matt Price is known for having some of the most extraordinary and outrageous stories drawn from the wilder side of life. And yet this self-effacing Cornish born comic brings real warmth and heart to his tales. Also support on the night from Sandi Smith who began performing in 2013 telling her stories with acerbic wit whilst managing to maintain a warm connection with her audiences. In her first six months of performing, she reached the semi final of Funny Women and the heats of the BBC New Comedy Awards.